Version 1.5 of the Beaver Builder Theme Is Now in Beta! Update: Version 1.5 of the Beaver Builder Theme is now live! All of the features and updates discussed below will be available to you after you update the theme. As always, before updating it's always recommended to take a backup of your site. We'd also still love your feedback on new features either in the comments or on User Voice. The latest version of the Beaver Builder theme is now in beta and ready to test! If you haven’t already, head on over to your account area and download a copy of the beta to check it out. In addition to a handful of new settings, this update focuses a lot on what can be done with the header. Here’s a look at the details of what we’ve been working on and what to expect. Please note that even though these header layouts appear the way they do in the screenshots above, they will adjust to our standard header layouts on smaller devices such as phones and tablets. In addition to more options for the header layout, we've also given you more options for the fixed header that shows when the page is scrolled. The only options you had before 1.5 were to disable the fixed header or have it fade in. While having it fade in is nice for tall headers that wouldn't shrink well, that technique essentially requires two copies of your header to be in the markup. That's not necessarily going to cause any problems, but there are some of you that have requested better alternatives. With that said, as of 1.5 I'm happy to announce that you can now choose to either have the main header shrink when the page is scrolled (as shown above), or have the main header be fixed to the top of the page all of the time. As of 1.5 it will be possible to hide the main header until the page is scrolled by the user. This new setting can be found in the Customizer under Header > Header Layout > Hide Header Until Scroll and is only available if you have the Fixed Header disabled. We've also given you the option to set the distance that the page must be scrolled before the header is shown with the new Scroll Distance setting. Another popular request that made it into this update was the ability to add a mega menu (shown above) to the theme. While mega menus can be a great option, the interfaces for building them aren't always so great. 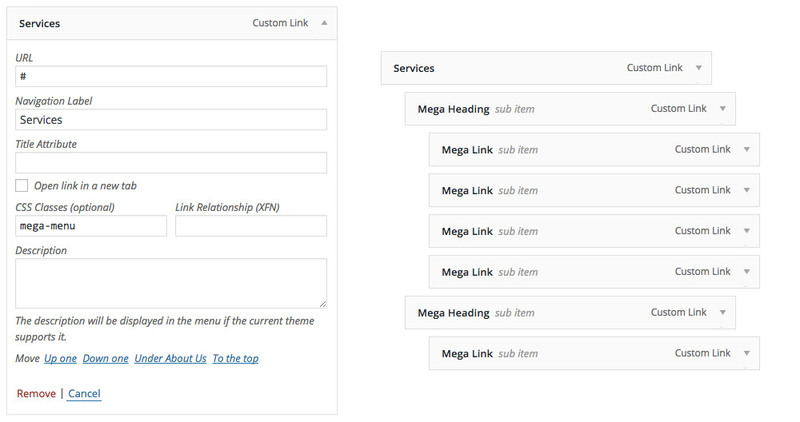 To keep things simple and easy to manage, we've utilized the native WordPress menu editor for building your mega menus. Just add the class mega-menu to any top-level menu item (shown below) and all of the menu items nested below it will be converted into a mega menu. It's that easy! Last but not least, in this update we converted a number of the theme's text inputs into slider controls to make it easier to adjust things like Font Size and Line Height. If you haven't met the newest developer on the Beaver Builder team, then head on over to Robby's update post and meet Ozan! While this isn't the first time I've personally taken a backseat on an update (Diego rocked 1.6.4), this is the first time that my only role was managing it. Ozan is responsible for everything you've seen here and we think he did a stellar job. Thanks Ozan! As with all of our beta releases, we’re planning on having this in beta for the next two weeks unless anything major comes up. Our goal is to get this out as soon as possible, but we need your help! More beta testers mean that we can find and fix bugs faster. If you haven’t already, be sure to download the new beta from your account area and test it out! If you run into any issues, be sure to let us know in the forum post for this beta. We already have version 1.8 of the Beaver Builder plugin in the works and are hoping to get that into your hands for beta testing soon after this theme release goes public. Be sure to head on over to our public roadmap if you're interested in seeing what we have cooking for that. It's going to be a good one! What’s your favorite part of this update? Be sure to let us know in the comments below! And as always, don’t hesitate to let us know if you have any feedback or if you run into any issues. Thanks, Joseph! Let us know what you think. Can I use the child theme with the beta for testing? or should I just test the theme directly. Either should work just fine. Let us know if you run into any issues with that. In the preview video that was released a few weeks ago did I overlook the mega-menu addition? On top of everything else, that was a nice surprise to find included today! So glad i upgraded to the full theme! This is great, cant wait to try the new features. Thanks, Villionaire! Let us know what you think. Wow, well done Ozan and team BB! Mega menus and more header options is awesome and definitely a welcome addition to the theme. This is awesome guys! Thank you for the excellent work! Thank you! I can’t wait to try these. I’d love an option to have a header image above the navigation, is this possible with the upgrade? You’re welcome! Could you provide an example of what you’re trying to achieve? Way to go BB team! We’re excited to test out the new theme! We just installed it and are now playing with all the new features! So far so good!!! one Quick Question. Is there a way to position the Navigation items completely to say the left? The logo and the navigation items don’t exactly line up. Either that or the ability to add or remove padding maybe on the logo? Thanks, Elizabeth! Can you provide an example of that in the forums? We can have a look there. This is wonderful! I have the plugin, but want to get the theme. I have a quick question about the content modules. .is it possible to design a layout where i can for ex: specify just the title, then in another module specify just that posts featured image, and another module for the meta tags, and another for the post content? Not currently, but that is something we are working on for version 2.0 of the plugin. For now, you have to enter that info manually. Yes, this is freaking awesome. Nice update what adds a lot of value. Thank you amazing BB team. Thanks for the feedback, Norm! We hear that request often and have it on our internal roadmap, but there’s no ETA as of yet. how do you install the new upgraded theme when you already have the older version installed? I cannot delete the older theme apparently because it’s working with the child theme which is active. Thanks! Hey Jeffrey, you can temporarily enable another theme (such as Twenty Sixteen), delete the old BB theme, and then upload the new one. Sorry it’s such a hassle for beta testing. We hope to have a beta testing updater at some point. Thanks for checking it out! Great Stuff Guys Keep up good work. Can’t wait to try it on my next project. You BB guys are great! Since you’ve added the scroll to top, which I like, is there a way to disable the menu from being sticky? You Guys rock – Keep on smashing it – Go Beaver Builder!